Equinox - Meeting the Maker of Seasons - andrea-hofmann308s Webseite! In German, we call the equinoxes “equal day and night.” As a child I believed that on the day of an equinox, night and day were of the exact same length. Ah, well, if things were that easy. Let’s just say, they are not and it all depends on the geographical location. However, not knowing any of this made my life much more magical. The equinoxes felt special, just like the longest day in June or the shortest day right before Christmas, the solstices. I had no idea how they were called, but I felt that they were some sort of threshold. When on March 21st our teacher announced it was "equal day and night", I felt like finally the door jumped open to the warm and colorful half of year. Folk tales convey that for our ancestors, it must have felt similar. The equinoxes brought the seasonal change, where the agricultural year took up drive - or started to slow down in autumn. Seeds were planted or the harvest reaped, cattle brought up to the alp, or taken down. Folklore is full of such activities, because in the end, they were all that mattered. Knowing the seasonal changes was life-saving. Still, there is lots of magic to be found. Folk tales never just talk about the plain visible things, the things that can be measured and statistically proven, no, they always include a magical layer. A Sami from Norway once said that in his language there is no specific word for “magic”, since magic is to be found everywhere and at all times. So, it seems that in earlier times also our forefathers expressed with their stories what otherwise was hard to put into words. Interestingly, when folk tales talk about astronomical matters, such as the equinox and the coming of spring, they speak of very personal encounters. People seem to have met the Maker of the Seasons herself, up close and personal, again and again, as for example Anton Wipfli from Wattingen told a Swiss collector of folklore in the 1920's. He said that every spring, an antiquated clad woman used to walk up towards the mountain pass of St. Gotthard and only returned again in the fall, where she mysteriously vanished in the woods of the valley. She was only seen again the next spring. On her way up or down the mountain she talked to people about taking lending-cows, seemingly offering her services to take them up to the alp or down to the valley, but then strangely, she never took any. It was as if she reminded them of upcoming tasks. To people, it certainly was a puzzling thing, but as a recurring event, it was almost like a ritual. "About 90 to 100 years ago, every spring, for many years, a mysterious woman came up from the valley", Anton told. "People said she was from Unterwalden. She wore a self-woven, striped little jacket with a bodice, as it used to be fashion a long time ago, an antiquated bonnet on her head and a stick from an old umbrella in her hand. Tied over her shoulders she carried an old-fashioned, striped roof. She did not stay anywhere; but those who met her on the street she asked for lending cows, and yet she never took any. She then migrated over the mountain pass St. Gotthard. If she came early, there was going to be an early spring; if she came late, spring was going to be late. However, no one ever saw her ever return until the fall. Then the same woman in the same garb, with the same stick, same old-fashioned roof tied over her shoulders, came down from the mountain and asked the people she met on the street for winter lending cows, but then again, she did not take any. If she came late, there was going to be a late winter, if she came early, winter would be early. She then walked down to the woods of Wassen and was observed how she went in, but nobody saw her ever coming out, and nobody who searched her inside the forest found her, she seemed to just have vanished. For all these many years she always wore the exact same skirts, with the exact same roof over her shoulders, carrying the exact same cane in her hand. She was believed to be an old witch." With this statement he seems to refer to the fact that during his life-time much has changed in people's beliefs. At the time of the telling Anton was 68 years old, therefore he must have been talking about the 1850's. This phenomenon happened everywhere in Europe: as soon as people’s lives became industrialized, with radio and electricity coming up, their access to the mystical side of life diminished. They probably no longer saw "the old witch" afterwards. So, in this case of rural Switzerland, up until the middle of the 19th century (or even later), people did not exclude the supernatural from their perception. They believed that an invisible life force shaped their visible physical world. To them nature’s forces were ensouled and humans were capable of direct interaction with them. From this tale we learn that the change in seasons was perceived as being brought on by the wanderings of an old witch. 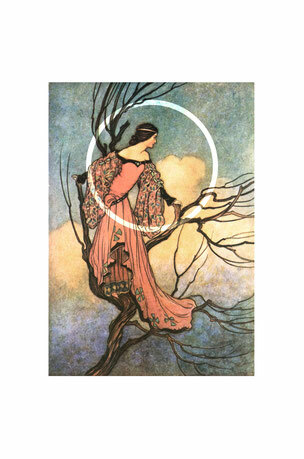 It was her who opened the door to spring around the time of the equinox. On her way coming up from the valley, she was like the warm rays of the sun that crawled up the steep slopes of the mountain. One can almost see how the line of the melting snow was withdrawing higher and higher, as she made her way up. By asking for cows she reminded people that shortly the cattle could be brought up to the alp, because it soon would be lush and green. Of course, she would not take the cows herself, for she was no cowherd. In autumn then, with the decreasing day-light “the old witch” descended again, taking with her the snow-line back down to the valley. The earlier she came, the earlier the cattle needed to go down to the valley, because winter was not far. In the ancient beliefs, the forces of nature came in various shapes. What got called "witch" was actually the Goddess on her path of reawakening the soil in spring with the help of the waxing day-light - or, of putting the soil back to sleep in fall with an increasing darkness. What a magical process astronomy can be! If you would like to read more about the ancient ways of looking at life, consult my new book "The True Hero's Journey in Fairy Tales and Stone Circles" , or order it directly from Amazon with the link below. I have no idea what type of clothing this could be, maybe a protection against snow or rain? Do you have any suggestions?